In my last article, I discussed the two wives of Hans Jacob Holzklau, Anna Margreth Otterbach and Catherine, maiden name unknown. What do we know about the first wife of Hans Jacob Holzklau, Anna Margreth Otterbach, and her family, namely, her sisters? 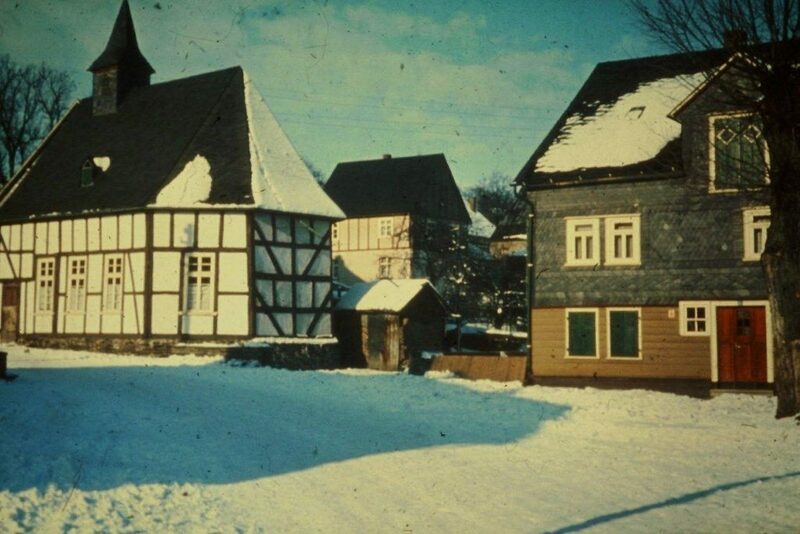 Hermann and Elisabeth (Heimbach) Otterbach lived in the village of Trupbach, in the house called, “Welmes,” that was built around 1680 and is still occupied today. Welmes is the house on the right, c. 1960. 5. Johann Jacob Otterbach, born 1695. This child died as an infant on 30 Jan 1696. There are no records in either Germany or Virginia regarding the sons of Hermann and Elisabeth other than their baptisms. We do know that Hermann Otterbach was the first of the 1714 group to apply for permission to leave Germany, just a few weeks after Johann Justus Albrecht signed the contract with the ministers of Siegen. In Virginia, we can only conjecture as to the fate of the daughters of Hermann and Elisabeth. We know that before they emigrated, the eldest daughter, Anna Margrethe, married the school master at Oberfischbach, Hans Jacob Holzklau, her lifelong friend and neighbor in Trupbach. But, we do not know when she died for certain, just that her death occurred between 1727 and 1729 when his second wife, Catherine, is named in a Virginia deed. We can gather some information about Margret and the other four daughters from the importation statements made by their probable husbands at the Spotsylvania County Courthouse in 1724. We can only guess as to the death dates of any of the Otterbach sisters. The only one of the above who is named in the will of her husband is Elisabeth, the wife of Peter Hitt, but there are no further records of her after her husband’s death in 1772. Maria Cathrina, the wife of John Joseph Martin, died prior to his death in 1758/59 and his second wife, Eve, was still alive in 1777. Elisabeth Cathrina, the wife of John Kemper, probably died around 1745-50, prior to her husband’s death in 1758/59. Anna Catharina, the wife of Harman Fishback, died prior to 1745 according to a deed dated 7 Feb 1745 in which Harman Fishback is solemnizing his marriage to the widow Mary (Otterbach)Noe/Nay. Unfortunately, there is no certainty as to the deaths of the five Otterbach sisters, all wives of members of the First Colony. Wouldn’t it be great to know when and where they died and where they are buried? Just another reason to take note of your female line, they’re the other half of your genealogy! Do you have a MISSing female in your line? If so, contact me at: Barbara.Price@germanna.org. First published in the Summer 2015 edition of the Germanna Foundation Newsletter. Get our newsletters mailed to your home by becoming a member. Thanks for sharing! Anna Margreth Otterbach is my 8th great Grandmother. So amazing that the house is still standing. Proud to be a Germanna Descendant!